For Steve and Donna Cooper, spending summers and weekends at Smith Mountain Lake means not only days spent relaxing, but also quality time with family and friends. To that end, the Coopers have poured considerable time and effort into creating a home that welcomes and delights. 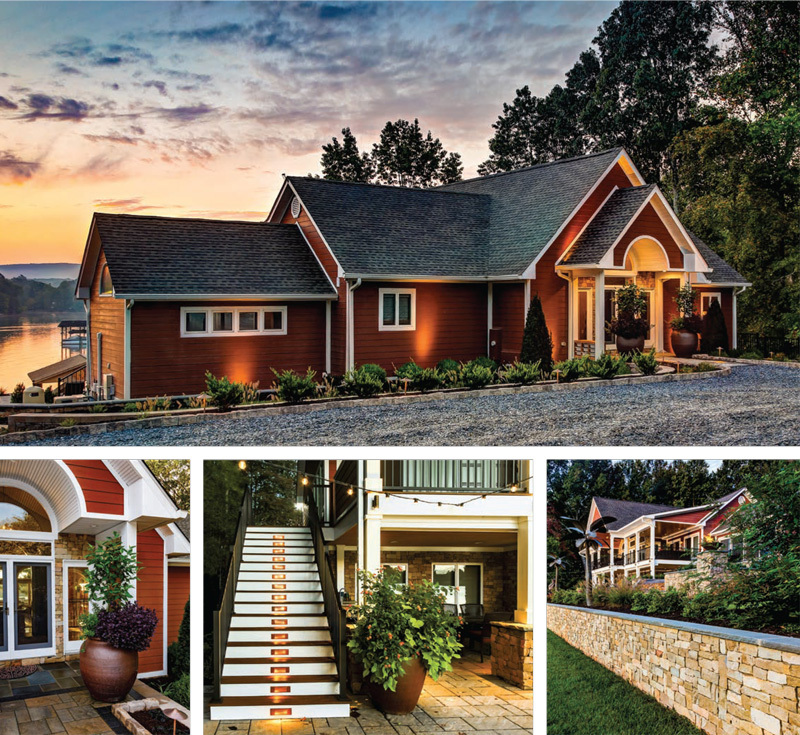 Positioned in a quiet cove in Huddleston, the 3000-square-foot main house features ample space to enjoy Donna’s culinary skills and plenty of thoughtfully appointed guest rooms. 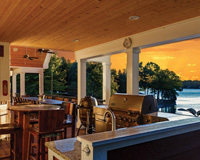 The lakeside layout, designed and built by Southern Landscape Group, is one of the most phenomenal entertainment spaces on the lake. It’s the kind of home where memories are made, which is exactly why the Coopers come here as often as they can. Growing up, Steve, a Michigan native, spent summers at his grandmother’s vacation home on Lake Winnipesaukee in New Hampshire. After college, he moved to Washington D.C., but always wanted a lake house. In the early 1990s, he bought a waterfront parcel at Smith Mountain Lake, in part because it reminded him of Lake Winnipesaukee. “It was the mountains, the trees, the higher elevation with cooler air and cooler nights,” he explains. He’s not alone in noticing the similarities between the two— “What about Bob,” the 1991 movie starring Bill Murray and Richard Dreyfuss, was set in Lake Winnipesaukee, but actually filmed at Smith Mountain Lake. Donna was born and raised in the D.C.-Maryland area, and says, “I’m used to the shores and the beach; that’s what I grew up on.” Steve and Donna are a blended family, with a total of four children—now in their teens and early 20s—between them. Though they live in Fairfax, Steve, a partner in an Arlingtonbased IT consulting firm, and Donna, who founded a children’s enrichment center and now works as a human resources consultant, come down to SML during the summer and as time permits throughout the year. 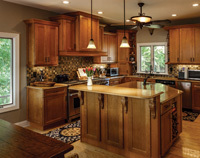 The kitchen renovation was important to Donna, who enjoys hosting a crowd. “I love to cook, and we often entertain groups of 30 people,” she says. “I do all the cooking, so I needed a big work surface.” An autographed Julia Child cookbook on the counter is proof of her passion for cuisine, and the well-appointed space includes maple cabinets, Silestone quartz countertops, and a custom center island. Two dishwashers help handle the crowd, and there’s also a 60-inch double oven with griddle, liquid propane Wolf range, prep sink, and appliance garage. The refrigerator and pantry are located where a powder room once stood, and a trestle table sits in front of glass doors leading out to the covered deck, which was finished by Southern Landscape Group and features two more tables and a grill. Next to the trestle table, a doublesided stone fireplace is flanked by a pair of arched doorways leading into the great room. In addition to the fireplace, the room features vaulted ceilings, a pair of Bali cabinets from Steve’s parents, who lived in Asia for many years, and a piano. Steve is a keyboardist in a band, and musical items and mementos appear throughout the Coopers’ home, including an orange amp next to the piano, which adds a fun retro accent. The master bedroom features exotic Mediterranean accents which reflect Donna’s heritage. The suite also features a custom walk-through closet with black shelving that Donna and Steve designed together, and Steve built. The master bath has double sinks, a large open shower, and a soaking tub, in addition to plenty of builtin cabinetry. The step-down master bedroom is decorated in shades of orange and turquoise, with exotic accents like Moroccan lanterns. “I’m Middle Eastern, so we wanted to put a Mediterranean flavor into the space,” Donna explains. The room has a closet that conceals a washer and dryer, and also features some fun and high-tech elements. Color-changing LED lights run along the ceiling of the bed alcove, and a large panel in the ceiling is a fiberoptic “starscape” which Steve designed and built, using LED light and fiber bundles, with constellation patterns drilled into the panel. Opposite the bed, a large arched window sits over a wall of sliding glass privacy doors, which change from frosted to clear in an instant at the touch of a button on the remote. The sliders open to a small patio which overlooks the infinity pool, with the dock and lake beyond. The home’s other bedrooms are downstairs on the terrace level. The main room here is what Steve refers to as “the pop culture cave,” and is filled with autographed musical instruments— including guitars signed by Bruce Springsteen and Bob Dylan— and a variety of musical and movie posters. The space is outfitted for fun, with two foosball tables, a pool table with purple felt, a retro video arcade game, and a seating area with two gray leather sofas and a durable concrete coffee table, perfect for watching movies on a retractable screen. Three guest rooms, a laundry room, and a bathroom open off the main space. The bath and bedrooms are all whimsically named: the Pineapple Bathroom, the Fish Room, the Bali Room, and the Blue Room. The Fish Room has tropical blue walls, and two sets of full-sized bunkbeds. For the beds, Steve thoughtfully designed and built niches into the wall, each equipped with a reading light, an outlet for charging electronics, and space for a glass of water or other necessities. The Bali Room is named for a Balinese door—brightly gilded and painted in shades of pink, coral and green—which accents the space, along with carved wood furniture. The bedding was made by Donna, and the room’s two windows look out onto the covered patio. The Bali Room has an en suite bathroom with two sinks, a built-in tub and separate shower, and the spacious closet contains a surprise—a bunkbed for when families come to visit. And of course, each bunk has one of Steve’s custom niches. Custom details abound in the exotic Blue Room, so named for its deep blue paint. The room features matching blue bedding atop a custom-sized Balinese bed, made of carved wood painted a glossy black. The bed is somewhere between a queen and king in width, but slightly shorter in length. Steve says with a chuckle, “We used to have a king mattress on there, but it would squirt out the sides,” so Donna had a custom mattress and sheets made. For a fun touch, LED lights that glow in different colors have been installed underneath the bed (similar lights are under the bunks in the Fish Room) and, like the other rooms, there’s also a bunk bed if needed. The laundry room, featuring more cabinetry and Silestone counters installed by Gowen, houses the home’s second washer and dryer, as well as two stainless steel refrigerators, an ice maker, and lots of storage space for handy lakeside items such as picnic baskets and coolers. From here, it’s an easy walk out onto the terrace, an expansive space designed and built by Mark Maslow of Southern Landscape Group, and outfitted in bluestone pavers. Tucked beneath the upstairs deck are two groupings of unusual outdoor furniture, made from pieces of Balinese boats, that the Coopers found in Edenton, North Carolina. “We saw it and loved it so much, we had to get some,” says Donna, adding, “Steve picked out most of these pieces. 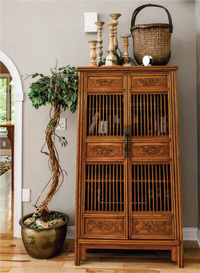 We thought it would be something different to the standard patio furniture.” It’s coincidence that the furniture, like their indoor pieces, is from Bali. “Maybe we should just go to Bali,” Steve muses, making Donna laugh. 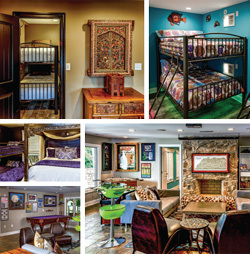 The terrace level features several guest rooms and a pop culture-themed hang-out zone. Moving out onto the open terrace, it’s clear that the Coopers’ lakeside landscape is the ultimate in entertaining. Two outdoor dining tables are stationed near a Belgard Chicago brick pizza oven, which Steve says they use often. The area is strung with cafe lights and accented with large urn planters, torches, fire bowls, lush landscaping and, strikingly, six metal palm trees that light up. “We found them at a show in Scottsdale, Arizona, and loved them so much that we had them shipped back here,” says Steve. To the left is the infinity pool off the master suite, complete with swim jets and lights for night-time. 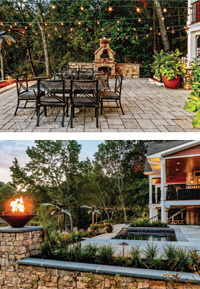 Ahead, the hardscape descends gradually to the lakefront, with rock ledge steps, a fire pit, and plenty of landscape lighting to illuminate the long summer evenings. 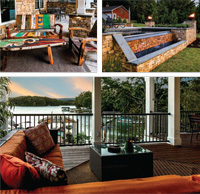 The Coopers’ lakeside landscape, with its lush and stunning design, is the ultimate in entertaining. The dock was the only thing here when Steve originally bought the property, and it has been put to good use. In addition to the slide, he also built a long, narrow picnic table which provides seating on the lower level, along with a porch swing at the end of the dock that looks out over the lake. The space is outfitted with creature comforts like a fridge and cable TV, and also houses their MasterCraft Maristar 230 VRS wakeboard and sport boat. Upstairs, a tiki bar and additional seating offer expansive views of the water, as well as the hatch to that slide. The top of the dock is decorated with flags representing the family’s colleges: Hope College in Michigan for Steve, University of Maryland for Donna, University of Mary Washington and JMU for the kids, as well as the Maryland and Virginia state flags, and placeholders for the youngest two. “It makes them proud of their institutions,” Steve says. For the kids, for family reunions, for friends from D.C., or just for the two of them, the Coopers’ extraordinary home is designed for pleasure. 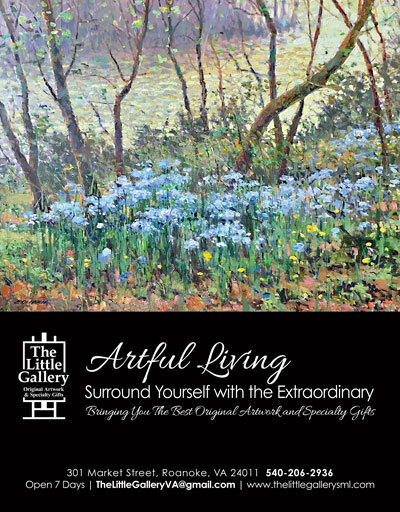 With no detail left to chance, Steve and Donna have created both a playground and a retreat that invites and delights. From the foyer to the dock, their home is filled with welcoming details and whimsical surprises, and it’s easy to see why the Coopers visit every chance they get.